Luxury wagons are few and far between these days, but the Volvo V90 more than fills this niche. Our customers and staff alike at Dyer & Dyer Volvo Cars love this vehicle, not only because of its interior comfort but also because of its outstanding performance features. 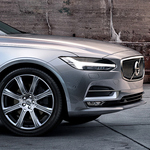 The V90 provides you with more than enough power for your daily commute via a standard direct injection turbocharged engine that delivers 250 hp and 258 lb.-ft. of torque. When you hit the pedal, the engine reacts quickly, giving you the acceleration that you want and need. You'll have all the power you need when merging onto an expressway. The V90 also gives drivers a variety of steering modes that adapt to your preference as well as driving conditions. These include Comfort, Eco, Dynamic, Off-road and Individual mode. You'll also get an engine stop-start system that helps you save on overall gas mileage.